A great game for all the family that's perfect for the garden, beach, or for taking away on holiday, camping and caravanning. 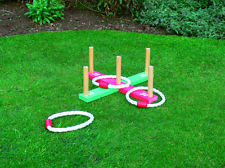 A a simple game of skill and accuracy, Quoits, is absorbing if you challenge a competitor or try to beat your own record. The set includes five real rope quoits, five push-in wooden pegs with a two section wooden base.